Another Waxcap - this time Hygrocybe conica. About 3 cm. across the cap. And another Helvella to add to my collection - Helvella elastica. About 8 cm. tall. 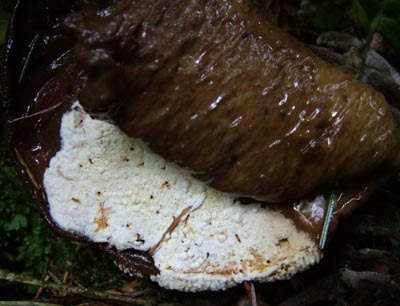 The dark brown object is a fungus that is well past its best. 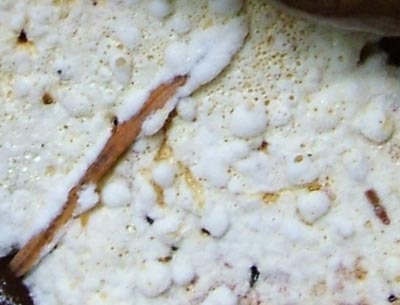 The white matter appears to be a fungus - maybe a myxomycete - that is growing on the body of the original fungus. Lactarius piperatus is one of the first and most frequent fungi in our local woodland. The milk - visible as white dots in the right hand image - is rather hot to taste. About 12 cm. across the cap.